A gruelling but deeply rewarding management sim. 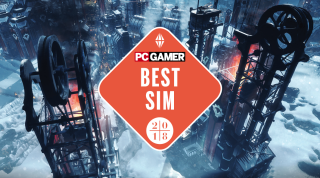 Frostpunk from 11 bit studios claims our next GOTY award. Find the complete set of them throughout December in our GOTY hub. Chris: At first it appears to be a beautiful steampunk building management game with survival elements. Construct a city around a massive coal-powered generator in a frozen crater, and keep your citizens warm, fed, and healthy. But it's the simulation of a desperate and fickle society, as well as your role as a leader, that makes Frostpunk such a challenging and unforgettable experience. You're periodically called on to pass laws, and each law comes with a compromise, the significance of which isn't entirely apparent until further down the line. When hungry citizens begin stealing food from your storehouse, it feels perfectly natural to begin a neighborhood watch program to keep an eye on everyone. But with its first few decisions Frostpunk is just grooming you, testing your morals, seeing how far you'll go in the name of saving lives. Later laws can allow you to build guard towers, form a patrolling militia, and eventually you might be spreading propaganda, having people sign loyalty oaths, and even having your band of enforcers perform public executions, all in the name of keeping your city safe and orderly, or at least convincing your citizens that you are in control. The appearance of order gives them hope, and the more tightly you close your iron fist, the more hope they have. By the end of the game you may wind up feeling you've only done what was necessary to save lives, but at the same time you may feel more like a monster than a savior. Fraser: All of the miserable, freezing people huddled around the city’s few heat sources thought that the perpetual winter was going to be the end of them, but actually it was me. I set aside empathy for a practical attitude, which is a nice way of saying that I made kids work in the mines. Frostpunk’s a strange survival management game in that surviving might not really be worth it, at least not for your poor citizens. Where other survival games use resource scarcity to push players to take risks and venture out further from the base, Frostpunk uses it to force players to make decisions about what kind of society they’re building at the end of the world. And mine was just awful. Survival still ultimately comes down to numbers—population, food stores, temperature—but the methods used to maintain those things are vastly more interesting than ‘build this thing’. Jody: Each time you finish one of Frostpunk's campaigns you get to see a time lapse of your settlement's life, pushing back against the ice as it expands. While that happens you're reminded of all the sacrifices that were necessary to make it possible—the scouts who died in the snow, overworked miners who had limbs amputated, the people who suffered under the draconian laws you passed out of necessity—and the cost of survival hits you. After all those hours of howling wind and sheets of ice, that was when Frostpunk finally succeeded at making me feel cold. Read Chris's Frostpunk review here, and check out his in-depth interview with the team behind the game.